Big Timing Comedy presents Comedy Night @ The Wine Bar! Big Timing Comedy's premier 2019 presentation at The Wine Bar in Cambridge Maryland! Starts at 9:00 PM EST! Enjoy a night out with your beau and or a friends to enjoy some laughs with good old fashion comedy, wine, and a cozy wine bar in downtown Cambridge MD! 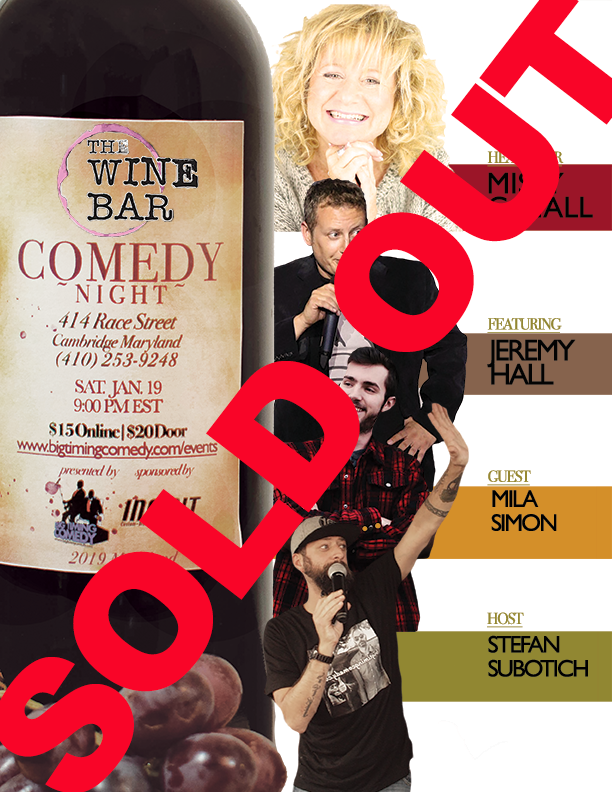 So come out and support eastern shore local business Eric Jolicoeur and Baltimore native Stefan Subotich of BigTimingComedy and The Wine Bar team up for a fun night in down town Cambridge Maryland! Follow our PODCAST Paco's Got Balls and become a Patron to listen to bonus content! You'll be thoroughly entertained! Missy Grynkiewicz Hall is the Queen of Happy Things! She loves to laugh, believes pants are optional and thinks the world would be better place if dogs were in charge. She is the 2013 winner of the Laugh Out Loud Competition, has worked as a warm-up comic for Harry Connick, Jr and her freshman comedy CD, “Miss Representation” was a first round Grammy nominee in 2012 for funniest comedy album. A seasoned actress/singer, Missy was recently featured in “Road Spill” on TruTV and in the feature film “Days of Power” with Eric Roberts released in 2018. Missy was also a finalist in the professional category of the 2018 Ladies Out Loud competition and a finalist at the 2018 Big Sky Comedy Festival. Missy is a comedian, mom and motivational speaker with a sharp-witted, universal style that captivates audiences around the country. She enjoys naps, her new dog, Dennis, and making up words that no one else understands. Jeremy Hall is a stand-up comedian originally from the Washington, DC area. He has been performing comedy since 2012. At just under 5-feet tall, Jeremy has a unique perspective on the world that he likes to complain about to every poor soul he meets. After years of performing in the DC area, Jeremy decided it was time to take his comedy career to the next level, so he left the small-town life of DC behind and moved to the bright lights of Delaware. Now he doesn't have to deal traffic or pay sales tax! A humble boy from humble beginnings. Stefan Subotich is a Baltimore Native born in Parkville, MD, otherwise known as the Motherland/ Land of Milk and Honey. He studied locally at Calvert Hall High School, before moving on to the renowned West Virginia University. It was at West Virginia that his education truly blossomed. He met many Rednecks, alcoholics, and generally obese people that loved his trademark wit and charm. He was strongly encouraged there to pursue a career in comedy. His travels later brought him home to the Motherland, where he landed a job as a Bartender at a local watering hole, Souris Saloon. There, he met many yuppies, alcoholics, and generally thin people that loved his trademark wit and charm. He was again strongly encouraged to pursue a career in Comedy. It was at this juncture that he came across Eric Jolicoeur and expressed his strong desire to Eric that he desired a career in comedy and entertainment. The two formed the powerhouse comedy super label BigTimingComedy, and the rest my friends....is history. Stefan enjoys all things Baltimore sports and a nice strong beverage. He excels at all delicious and wicked. So, please, drop him a line on the twitter @bigtimingcomedy, or come out and support his unique brand of highly offensive comedy. I promise, even if you dont laugh (which you will), youll be entertained.